Change is only 50 minutes away! 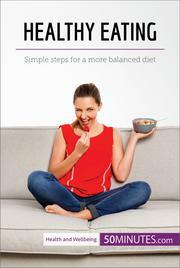 Find out everything you need to know about eating more healthily with this straightforward guide. Most of us are well aware that we should be eating more healthily, but it can be difficult to sift through all the contradicting dietary advice available to us and get a clear idea of what that means in practice. Coupled with the pressures and fast pace of modern life, this makes it all too easy to fall into bad habits. However, by taking a comprehensive view of our basic nutritional needs, it is possible to identify some fundamental steps that anyone can follow to improve both their diet and their overall wellbeing. The Health and Wellbeing series from the 50Minutes collection is perfect for anyone looking to be healthier and happier in their personal life. Our guides cover a range of topics, from social anxiety to getting ready for a new baby, and provide simple, practical advice and suggestions to allow you to reduce stress, strengthen your relationships and increase your wellbeing.